And the latest contribution:The image is representative of an early Canadian Northern Railway (CNoR) Standard Third Class Station (CNR Plan 100-3). The prototype, designed by corporate architect Ralph Benjamin Pratt, Winnipeg, was issued on 18 September 1901. It reflected the CNoR’s desire to create an immediately recognizable architectural logo for its depots.Between 1901 and 1924, 400 Third Class Stations were constructed in western Canada by the Canadian Northern and Canadian National railways. Similar depots also appeared on some of the CNoR’s lines in Ontario and Nova Scotia, but other than a handful of these, most had different architectural features that are not reflective of the image. As such we can reasonably assume (?) 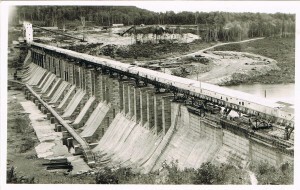 that the image was on the company’s Western Lines, specifically between Port Arthur and Edmonton, the geographic limits for this particular “phase” of the design. There were five distinct “generations” or “phases” of this pattern, plus a few larger variants. Each successive phase had improvements, most relatively minor. 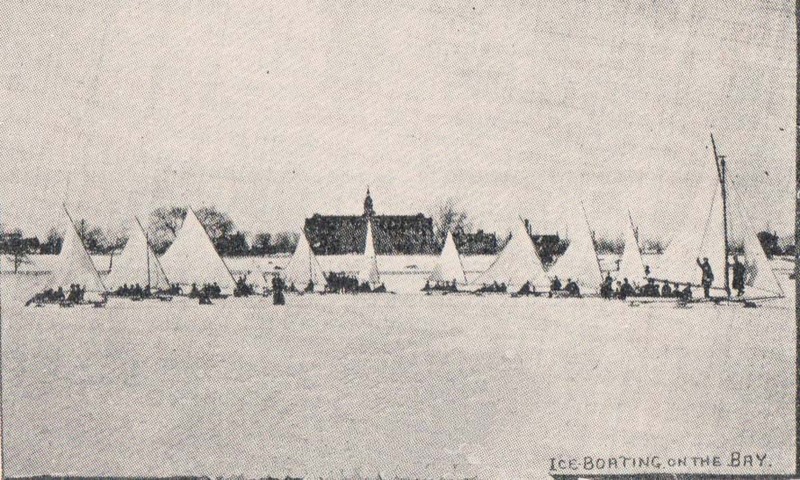 The image represents either the first generation (59 built – 1901-1906) or the second (18 built – 1906-1908). While the stations are “standard”, they were prone to some deviation in detail that can help to refine the search, namely: orientation (left hand–at least 4-or right hand–at least 69), the construction details of the triangular pediment (shown is the most common of the three variations), and the decoration, if any, that surmounted the peak of the pyramid roof (the galvanized ball was uncommon). Taking all of the foregoing into consideration, the image is likely of the depot erected at Lamont, Alberta in late 1907; far from definitive, but we can certainly eliminate 90% of the known examples of this design. Hopefully, we can get additional information sometime in the near future, to determine its correct identity. 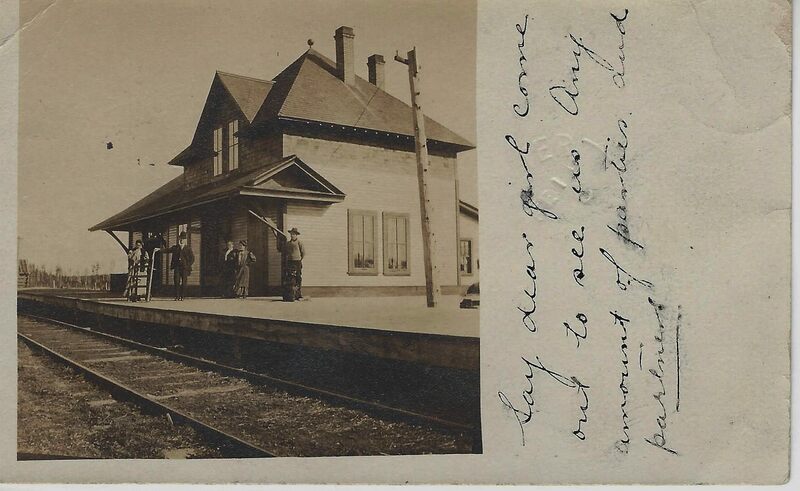 More on these class 3 stations here: Canadian National Railway Stations of Central Alberta – Forth Junction Please send any additional info with supporting information to info@torontopostcardclub.com. UNSOLVED Mystery Postcard #5. Trying to confirm time and place of this view. 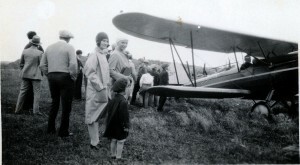 The owner of this airplane RPPC was told that it was taken in Sudbury in the 1930s and he would like to know why. The tail letters are NC then?3K. Click on the picture and it will enlarge. Please send any theories with supporting information to info@torontopostcardclub.com. NEW INFORMATION from Dave H: – I believe that the aircraft is pre-1938, NC denotes American Commercial registration. It is possibly a mail plane from a U.S.city, maybe a first flight from ? to Sudbury. Mystery #2 Solved! 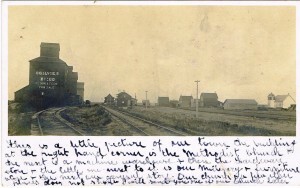 … to identify the town where the grain elevator ‘Ogilvie’s No. 100’ in this RPPC stood. 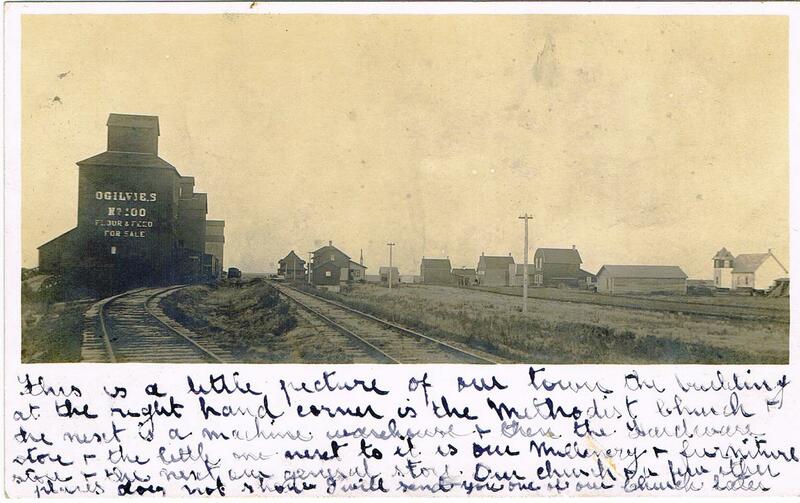 (click on the picture to get a larger view) We have a strong indication that it is Wheatland, MB from a view found in the Province of Saskatchewan SAIN photographs . The unique form of the church in both views suggests that they are the same. There were two Wheatland post offices in the same general part of the province: one south of Oak River which opened in 1882 and closed in 1905, whereupon the second (and current) Wheatland — near what was to become the Town of Rivers — was renamed from “Westwood” (post office). This change was duly noted in the Manitoba Free Press in early June of 1906. Thus the card view is likely later than mid-1906. In addition, the station in the centre distance strongly suggests that this is Wheatland. Very few of this style of depot were constructed and most were constructed as replacement stations in established towns. The Lenore Branch (of the CPR) was one of the few lines that had this style of depot erected on a new branch. Identical depots of this style were erected at Wheatland (x-Westwood), Kenton and Lenore on that branch. See a 1970 photo of the Wheatland depot here. We are still hoping to verify that this is Wheatland by a reference to an Ogilvie grain elevator #100 in that town but we’re 99% sure that it is Wheatland. Thanks to the 3 TPC members who provided the above insights. Our search has taken us to several interesting related web-sites such as grainelevators.ca. If you can add to this knowledge, please let us know. Mystery #1 Solved! Thanks to Paul from Warkworth for giving this main street RPPC an identity. It’s a view of Blyth, Ontario. Using ancestry.com, Paul searched for ‘Dr. W.J. 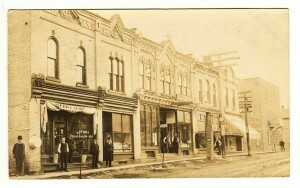 Milne’ as seen on the shop awning to the far right of the photo and found that he had practiced in Blyth in the early 1900s. 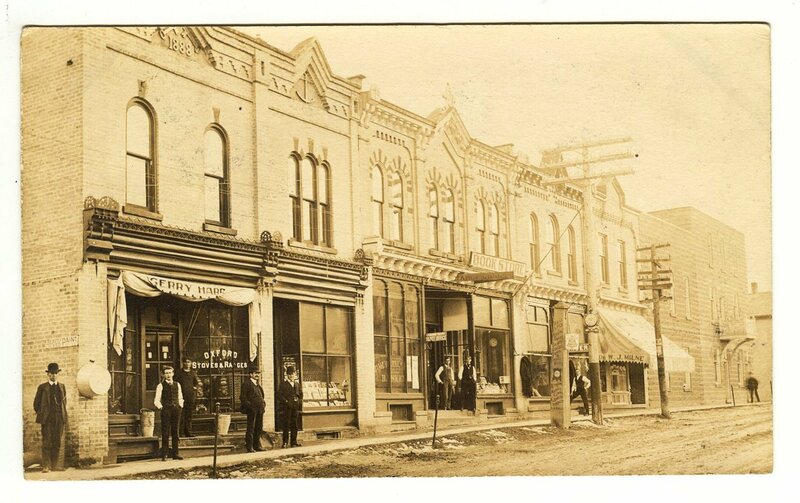 He then found a Blog about Blyth where the picture of the main street confirmed his research. The buildings still stand as seen in this Google maps photo but they have lost much of their grandeur. Demonstrating the power of the Internet and the lure of the history revealed in vintage postcards, the request for help in identifying this card came to us from The Ontario Historical Society which had been contacted by the RPPC owner from Colorado! Error: Error validating access token: Session has expired on Friday, 12-Apr-19 20:21:58 PDT. The current time is Friday, 19-Apr-19 21:36:27 PDT.